The Cocoa Beach Air Show is a premier event and already being compared to the top five air show events in the nation. With prime oceanfront viewing and a growing list of big name performers and sponsors like Geico and Embry Riddle, you don't want to miss this show stopper. Featuring F-16 Viper Dare Team whizzing by, low altitude flyovers, and civilian aerobatics or stunt flying is all part the spectacular event. It's more than flying. 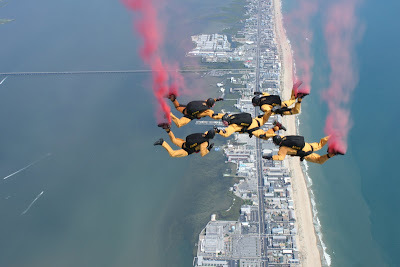 There's skydiving too by the U.S. Army Golden Knights. Select viewing locations require ticket purchase. Even at $21-20 it's a fun, family, affordable event!!! Plan now for the best seating and make it a weekend or weeklong event. Here are my favorite places to eat, dine and spectate. Don't stop at the sky, go beyond to the moon and visit the Kennedy Space Center. A visit to Cocoa Beach is never complete without a stop at the surf emporium Ron Jon's Surf Shop. Want the best pizza? Then head over near Titusville to a hidden, non-descript shack building alongside the Indian River to Harold's Pizza. I grew up with Harold's alongside the other chains, and this pizza is thin, crispy with tangy tomato sauce and absolutely the best toppings. Add a trip to Miami, one of the flight instruction capitals in the U.S., for your very own private lesson for aerobatic flying with MiamiFly.com. October is always the best month to travel, recession or boom, so book your hotel now. I Deam of ... Flying like a Bird! It can come true.